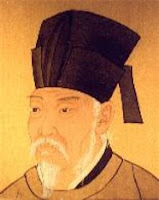 In the eighth century, Bai Juyi (白居易) came to the city of Hangzhou, where he had been appointed as governor. It was his first important post in the seven years since he had been disgraced for his failure to catch a murderer. He had been sent into exile, and only now did he have a second thin chance. He was eager to prove himself capable. Hangzhou is centered around the West Lake (西湖). The Lake is very beautiful today, but when Bai arrived in Hangzhou, it was forever running low because of the poor repair of the dykes. Local farmers could no longer depend on it. He had the dyke repaired and causeways built, settling the lake at a useful level. In the process of making it practical, he also discovered how beautiful was this shining lake. He began to walk along its edges daily, absorbing the sight. In his exile, Bai had honed his skills at poetry. We arrived in Hangzhou in the early afternoon. Lizzie and I were badly stressed, since we had been worried about our train and our time in Shanghai had been as strenuous as it was rewarding. Hangzhou immediately made things worse. There were no taxis to be had. Thumping down the sidewalks with our heavy packs, we walked from one side of the dirty concrete station to the other, and then back again. Chinese people milled about and jumped into buses and pedicabs and cars. We looked for people getting taxis, but found ourselves unable to imitate them... the taxis just drove past us and picked up someone who was Chinese instead. I don't ascribe it to explicit racism; a Chinese person getting a taxi from the station was almost certain to be going farther and be a better fare than a laowai (老外; a foreigner). But it was still extremely frustrating not to be able to get a cab because of my ethnicity. After twenty minutes of tramping in the sun and staring angrily at passing taxi drivers (I had the feeling that if I could just get them to turn and look at me, they'd have to feel guilty enough to stop) we finally managed to get a rip-off taxi. This unlicensed tumbledown van lurched through traffic and overcharged us for a brief ride to our hostel, the Westlake Youth Hostel. We were frayed down to threads. It's amazing, though, what an afternoon nap will do to cure what ails you. We slumped down into the big bed of the hostel room, and after some time asleep in the blessedly quiet room, we walked out to the lake. The Shanghai bustle and misery of the trip from train to hostel faded from us, as we strolled hand-in-hand down the narrow cement path through the trees. It was near sunset. The sun hung fatly across the lake, smearing red across its surface, and finally dipped into it, and was gone. I discovered that the West Lake is very beautiful in the twilight. The next morning - our sixth day in China - we rose to take a more serious look around Hangzhou, feeling rested and cheerful despite the continuing heat. We never really saw much of the city center; but then, reportedly there's not much to see. A grimy smallish Chinese city, with some temples and silk merchants and whatever else. Instead, we stayed around the lake, which was ringed with pathways, temples, arches, and parks. It was all small and close and fun. The West Lake is very famous within China, and is one of the top tourist destinations for Chinese people in their own country. It's only semi-famous outside of China, falling into the category of "Chinese-Cities-That-Are-Not-Shanghai-Hong-Kong-or-Beijing," along with X'ian, Chengdu, and Nanjing. It wasn't too hard to see why the Chinese loved it: despite being wholly and completely artificial in almost every way, it was very pretty. It had no wildness to it, but instead the West Lake and its surroundings had the sculpted attraction of an outdoor garden - a garden subsequently packed with a thousand guys trying to sell you a boat ride. Hangzhou has a useful bike system. For a $45 deposit you have essentially free use of the public cycles. You just swipe your card over one of the locking stations at the numerous kiosks ringing the lake and other areas, then pull free one of the uniformly shoddy red-painted bikes. In actual practice there are some problems: it's kind of a hassle to get the card and to get your deposit back; most of the bikes have some mechanical problem; all of the bikes are too small for tall people; sometimes the locking stations stubbornly refuse to relinquish their bike. But overall, well worth the money. We biked and toured around all day, and ended up not paying a dime for the privilege. The only cost was to my bruised knees as they battered low handlebars. We saw some temples and some monuments, such as the Temple of Yu Qian and the Memorial Hall of Zhang Cangshui. Unwittingly, we actually visited the memorial halls for each of the three "Heroes of the West Lake": generals who had been caught up in the shifting alliances of the Ming dynasty and acted virtuously in some obscure manner. Scattered among the 15th and 16th century halls and tombs were memorials of a more recent vintage, to heroes of the revolution. They were small and we skipped them, barely even noticing them as we did. Without question, Lizzie's favorite thing in Hangzhou (perhaps in all of China) was a tree. An enormous camphor tree, specifically. It was extremely old and extremely big, propped up on braces so it didn't collapse under its own weight. It was hidden up a hill on a thin road, and has proven impossible to find on any maps or guide-books; I don't know where it was. For food, we had noodles with vegetables and vegetable-fried rice. To solve the vegetarian hurdle without being able to speak Chinese, I had taken the time to create a set of small laminated cards to show restaurateurs, reading, "I eat vegetables." It seemed this was the best way to express my desires, after some examination of the language. Once we got to China and I discovered that people mostly just squinted at the card and stared at me, it occurred to me that this might not get the message across. They must be thinking, "He eats vegetables. So why tell me? Of course I was going to give him vegetables with his huge chunks of greasy beef." So I borrowed a guide book and memorized the Chinese for, "Do you have any vegetarian food?" I memorized this phonetically (laoweilao sushi chichen?) with particular care for the intonations that are so important to the language (lăowéilăo sùshí chíchèn). It never made much difference. Either there was a secret code or (more likely) Chinese is as hard as hell to master even in a small piece. Incidentally, I also learned the word for "water" (schwei) but never succeeded in ordering that at a restaurant, either. I always had to resort to English, which was instantly understood. In the evening, it rained lightly. We relaxed and drank beer and read quietly and happily. The Westlake Youth Hostel was restful and friendly overall, with good food and nice people and clean rooms. But I don't think I could ever recommend it to people because of a single extremely important reason: it had bedbugs. I hate the very idea of bedbugs. They're extremely hard to kill, and their eggs are almost impossible to eliminate. They spread faster than kindergarten pinkeye and stow along with you unnoticed. So to wake up in the night and find two or three slipping away from the kindled bedside lamp - it bothered me a great deal. So you probably should not go to this hostel, because bedbugs are almost invulnerable and the Westlake Youth Hostel will probably still have them. There were other - more sanctioned - pets present. The dog, Cocoa, scuttled around the place on those stubby little trotters possessed by small dogs. As we ate fries and sandwiches in the late morning, Cocoa was fun to play with, snapping his head back and forth with wide eyes. The recent rains, brief as they had been, were enough to alleviate at least some of the heat. It was finally less than evisceratingly hot when we went outside. It wasn't much less than eviscerating - possibly hovering around the "sweltering" mark - but any temperature below the point where I feel like my innards are going to melt was an improvement. There are numerous little boats on the lake, and we bought a ticket to go out on one. We were heading for one of the highlights of the area, the Three Pools Mirroring the Moon (三潭印月). The boat ride was interesting. The boat was big and made of plastic and metal paneled over with fake teak, and the twenty people with tickets all crowded on to try to get the spots under the roof and protected from the sun. As the motor throbbed and we slowly moved out onto the lake, a guide jabbered in rapid Mandarin about the wonders of the lake. And it really was quite beautiful. Willows hung low over the edges, small wooden bridges leapt the narrow tributaries flowing in from the north, and inscribed pailou stood tall on the shores. One of the pailou that deserves mention was one we visited on foot later, the Kungfu Landmark (功夫标式). The English translation they gave on the arch was actually something like the Memorial Arch of Supreme Martial Accomplishment (or something like that), but after an hour (!) of extremely laborious Mandarin translation from the picture, I think the more modest name is the accurate one. It represented a little landmark to... well, martial arts in general. As our boat slid next to the dock on the island of Three Pools Mirroring the Moon, Lizzie and I stepped out of it and looked around for a moment, hesitating. In both directions were large ponds filled with lotuses and crossed by long wooden walkways, studded with pavilions. Every which way looked identical. A perhaps-helpful mother on our boat commanded us to go left, and we obliged obediently. The islands are artificial, with Three Pools Mirroring the Moon resembling a solar cross. The original island was much differently-shaped, but was built up and then reshaped to contain it large lotus pools. Interestingly, the "three pools" are not the pools of water, but rather a set of three pagodas where a famous poet once declared the view of the moon was especially beautiful when joined with the nighttime lanterns. The view is actually one of the "Ten Views of Hangzhou" (西湖十景), ten canonical sightseeing spots described by the Qing dynasty Emperor Qianlong. We didn't make much attempt to try to track them all down, since many of them are dependent on a specific time of day or year, like "Remaining Snow on the Bridge in Winter" (斷橋殘雪). I'm not sure it would have been worth it even if possible, since the ones we did see, like "Orioles Singing in the Willows" (柳浪聞鶯), were probably among the most heavily commercialized areas on the West Lake. Still, "Three Pools Mirroring the Moon" (三潭印月) remains beautiful enough to be memorialized on the one yuan bill. The lotus flowers were beautiful and simple as they always are, especially the sparkling gems of water sitting in the cup of the lotus leaves. Under some of the bridges, fat koi thrashed around and fought over scattered crumbs. There were a few entertainers, including a guy with two parrots that he sprayed down with water regularly to keep cool and left them sullenly flapping sodden feathers. That was essentially the end of our time in Hangzhou. We saw a few more things, but mostly we just relaxed some more and got ready for the next and final leg of our Chinese journey, Beijing. Hangzhou had been a welcome respite from big cities, and had shown me what artificial garden sculpture can be when taken to enormous sizes by a dedicated city council. Hangzhou was quiet and sedate, and so was our experience. With relaxed minds and brimming with anticipation, that night we caught the sleeper train to Beijing.